SDLP MP for South Down Margaret Ritchie has welcomed the commencement of work of a new build three story Area Command Unit at the former Downshire Hospital Site. 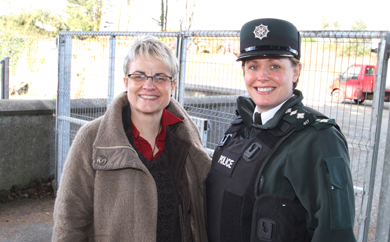 South Down MP Margaret Ritchie with PSNI Area Commander Deirdre Bones look over the site where work has commenced on a new police station adjacent to the Down Civic Centre in Downpatrick. Ms Ritchie said: “I am pleased work has finally commenced on the new build PSNI, which I have been campaigning for, for a number of years. “The work was initially due to being in 2011/12 but was re-phased to this financial year. The new Police Station will signal a new phase of regeneration for Downpatrick, in terms of both the centre of public service excellence that will be provided at the New Downshire Administration Site, and also in the town centre. “This new build facility will allow for the demolition of the current PSNI station in Irish street, which will greatly assist traffic flow in Downpatrick. This was outlined in the DSD Masterplan for Downpatrick, which I brought forward during my time as Minister.